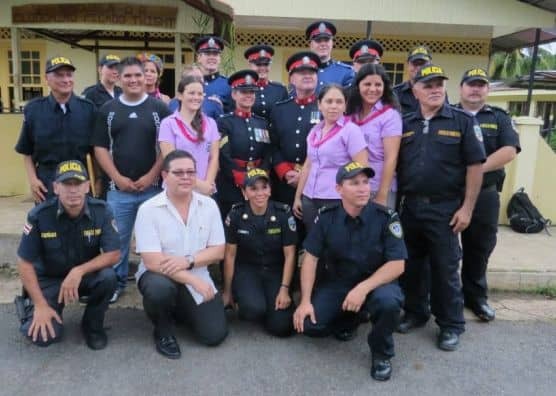 Pictured above, Calgary and Edmonton Police Service officers, along with their Costa Rican counterparts, in Costa Rica in June 2014. Several of Calgary’s finest will walk a decidedly unfamiliar, and ultimately rewarding, beat this Thursday. Seven Calgary police officers will join three of their colleagues from the Edmonton force on a 10-day excursion to Costa Rica, tasked with building playground for local children while getting an education on Latin American culture. “It’s a great opportunity for the Calgary Police Service to show their interest and commitment to being involved in the needs of the Latin American community,” said Frank King of Samaritan’s Purse Canada, the organization responsible for arranging the trip. Removed from St. Jude school in southwest Calgary two years ago, the playground is destined to be installed in a village near the nation’s capital of San Jose. This is the second such trip to Costa Rica for Calgary cops, who will also once again hand out Operation Christmas Child gift boxes to needy kids-considered to be the highlight of these trips. “Many of these kids have never received a gift in their entire lives,” King said. In addition, the Canadian cops will spend time with their counterparts in the Costa Rica national police force, trading wisdom and gaining a better understanding of Latin American people and culture. While learning about the people they serve is important for any police officer, putting smiles on the faces of less-fortunate children pay dividends long after they arrive back home, King said. “Lots of folks realize there’s no downside to this,” he said. Visit Samaritan’s Purse website here.